Enolsoft Co Ltd., a trusted name for developing multimedia software just launches PDF Converter for Mac software. With this newly launched software OS X users will be able to transfer PDF as well as password protected PDF to other document formats ranging from Word .docx, PowerPoint .pptx, EPUB, RTFD, Text, HTML, JPG, PNG and TIFF etc., preserving tables, text, fonts, images, graphics and hyperlinks in comparison with the original document. 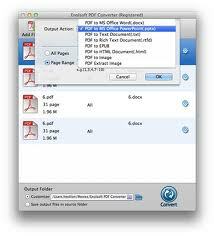 This Enolsoft PDF Converter for Mac is an 8-in-1 PDF converting program supporting PDF to Word Converter, PDF to PowerPoint Converter, PDF to HTML Converter, PDF to EPUB Converter, PDF to Image Converter etc. PDF Converter for Mac can augment the conversion quality to a great extent as the software provides support for batch conversion mode and partial conversion mode. Ability to edit PDF tables and text in Microsoft Office Word for Mac 2008/2011. Convert PDF to PPTX slides for presentations. Create a PDF into Web-Ready HTML, facilitating to enhance the availableness of PDF with an HTML copy. Transform PDF to EPUB Format for making it readable on many accepted eBook readers like iPad, iPad 2, iPhone 4S, Sony Reader etc. Ability to immediately transfer PDF to Plain Text and RTFD format on Mac. Save PDF to JPG, TIFF, PNG, BMP, GIF Image formats. Take out images from Adobe PDF files and after that transform the extracted images to suitable image formats like TIFF, JPG, PNG, GIF and BMP. Open converted files on iWork Pages and Keynote. Tailor the output quality at the time of converting PDF to image format. It is a Standalone application and the users don’t have to use Adobe Reader or Acrobat.